Water is the essence of life itself, and it is vital that we have access to clean, drinking water at all times. This is a commodity that you cannot go without, and also one of the most common vectors when it comes to health outbreaks and pandemics. In fact, most of the stomach bugs that you had experienced in the recent past were on account of drinking contaminated water. Of course, you need to boil the water but that alone may not do the trick as some pathogens are known to survive the process. So to ensure that the water is completely dirt free, disease and pathogen free, you need to filter it before you can drink the same. And let’s face it, no one has ready access to naturally clean drinking water, not unless they lived right next to a Himalayan spring, high up in the mountains. What you need is an RO based form of water purifier, one that utilizes technologies like UF, UV and MF to filter out all the impurities and provides you with 100% safe, clean drinking water. Which is the Best Water Purifier in India? But the problem isn’t solved, not in the sense that you may have thought since now, you will have to choose one purifier from the hundreds of branded ones, which are available in India. More often than not, these are often touted as the best. Granted, that nearly every water purifier that gets launched gets billed as one of the best, but in reality, they may not be as effective as some of the other reputed water purifiers in the market. That’s why we have vetted some of the top-ranked water purifiers in the Indian market and, reviewed them below for your ease of mind and convenience. Do check them out and depending on your current budget, purifier functionality, you can select the right one for your home today. Blue star is a brand that you are bound to have come across when it comes to air conditioners, and yes; they are a recent entrant to water purifiers. That being said, Aristo is an elegantly designed water purifier that utilizes Reverse Osmosis to filter out the various contaminants. It also comes with UV water filtration system and a storage capacity of six litres, which should enable you to meet the daily drinking water requirements, of your household. It is designed to work effectively between 220-250 volts which is what you normally get in any electrified household, pan India. This purifier does a lot more than clean up the water; it helps to improve the taste as well, thanks to its ATB technology and its multi-filtration process. But what makes this new entrant stand out and for the right reasons is the fact that it is also one of the few water purifiers that are quite effective in ‘sanitizing’ ground and municipally supplied water of various contaminants, metal residues, various chemicals and more. It also comes with various alerts that let you know that the filtration is in the process, that it is complete, and when the storage capacity has been reached, etc. 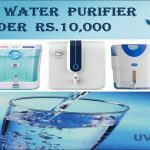 Given the rapid increase in the number of patients suffering as a result of various waterborne diseases, it has certainly become evident that you need a water purifier with a reputation for being tough on germs, dirt and extremely effective. 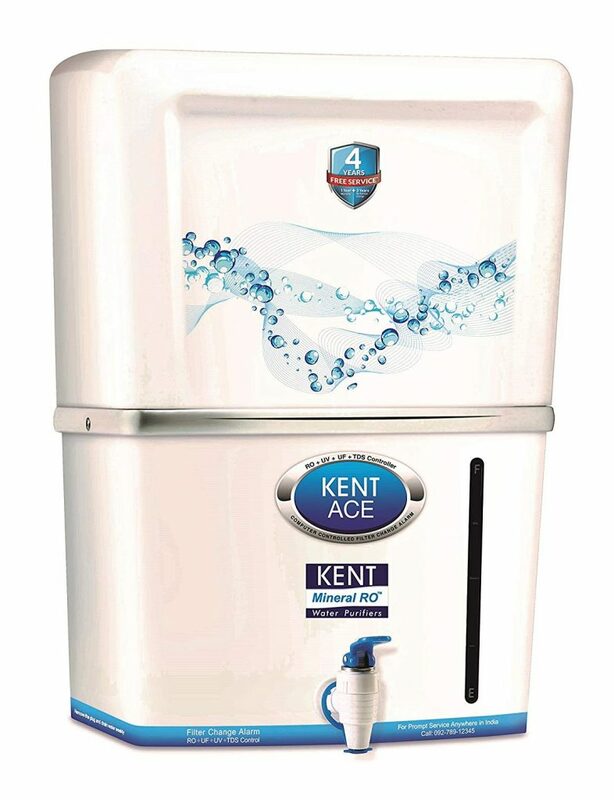 And Kent is one such brand; it has already managed to develop a reputation for being one of the top water filter brands, across India. This particular product uses the latest technology, uses RO+UV+UF water purification process to clean the water of various residues and contaminants. Irrespective of whether you use groundwater or municipal water, this water purifier will effectively help you clean it of its various contaminants and provide you with safe and tasty drinking water. And yes, it helps to improve the taste of the water as well. You can set up a demo; test it out before you agree to purchase the same. It comes with a detailed manual that should effectively clue you in as to how this water purifier works and what you need to do to take care of the same. 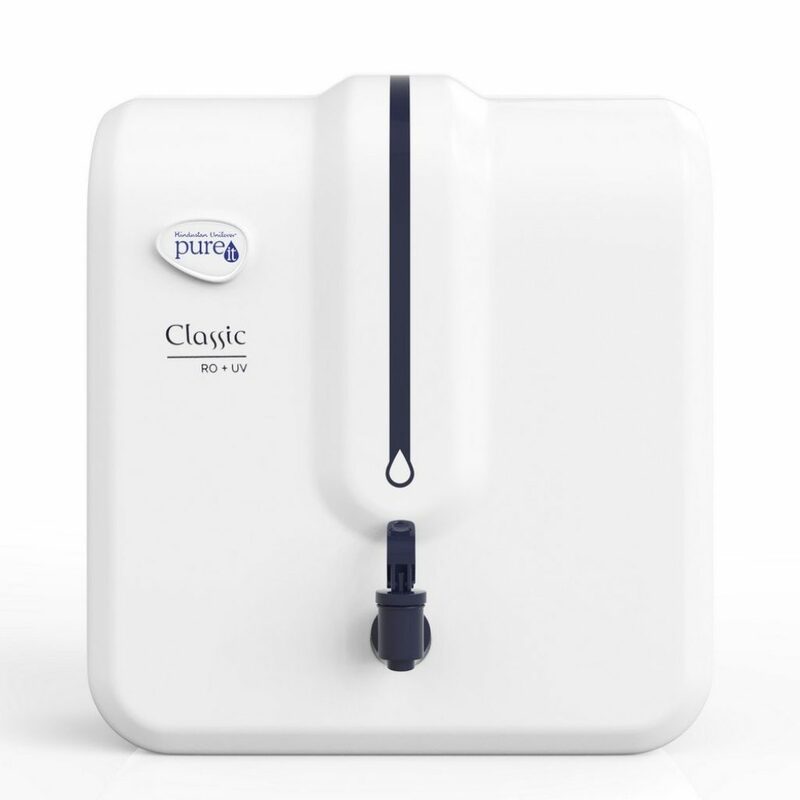 It comes with a capacity of 8 litres and has been certified and awarded by more than a few organizations for being a reputable water purifier. If the water is too hard at your place you will have to change the filter a lot more quickly. If you are looking for an effective water purifier with advanced functionality, then this is the one that you would need to take a closer look at. For starters, it comes with MTDS technology which should help to purify the water as well as ensure that it tastes better, in the process. Aquasure is an elegantly designed water purifier, which uses RO technology as well as UV filtration to filter out the various contaminants out of the water. 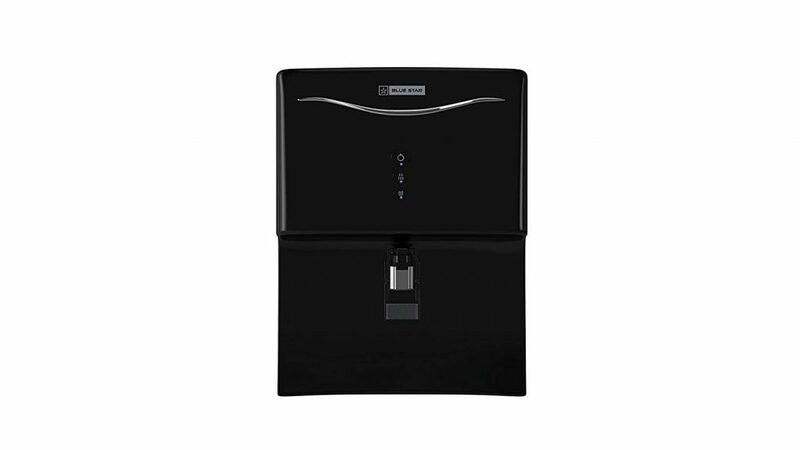 What makes this water purifier interesting is that it is also one of the few top-ranked ones to come with power saving feature that automatically turns off, once the 6-litre storage tanks are full. That should help you save up on the power bill as well but it should be pointed out that Aquasure does not consume too much power, as it is. It is quite effective in removing various contaminants from the water and comes loaded with various alerts, which lets you know when the filtration is complete or when the storage tanks are full and so on. It is quite good and comes with a reasonable price tag. The fact that it uses MTDS technology; chances are that you obtain your water from several sources and given this, the MTDS feature would prove to be quite handy. the 4th entry in the list of best water purifier in India is Aquatec Plus advance Plus water purifier. This is an elegantly designed water purifier that comes with all the advanced functionality that you can expect in one. What should be pointed out is that Aquatec is a new entrant and comes reasonably priced, compared to some of the other brands that offer similar features and functionality. 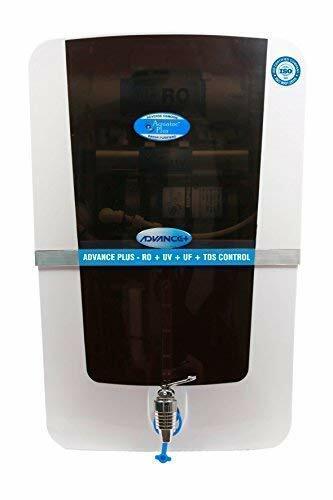 For starters, this water purifier utilizes RO (Reverse osmosis) as well as UV+UF filtration process; in fact, it is so effective that it is able to effectively clean up 99% of germs, pesticides, dirt, particulates, metal contaminants, chemicals from the water. What’s interesting is that it can filter nearly 15 litres per hour and comes with storage tanks that can hold nearly 12 litres of filtered water at a time. It comes with all the features, including various alerts to let you know when the filtration is on when it is complete, and also lets you know when the storage tanks are full. This is one comprehensive water purifier. If you are in the market for an effective but extremely fast water purifier, then this is the product that you need to consider. It is extremely effective and uses both RO+UV filtration to process the water into something that is 100% free from various contaminants and is safe to drink. In fact, this is one of the few water purifiers that you can connect directly to your tap and watch it filter the water, almost instantaneously. It can process the water at the rate of 1500 PPM which works to around 12 litres per hour, and incidentally, this product also comes with 6-litre storage tanks, so you should be able to stock up on filtered water as well. This product uses six stages to filter the water and also comes with mineralizer which helps to boost the taste of the water as well. 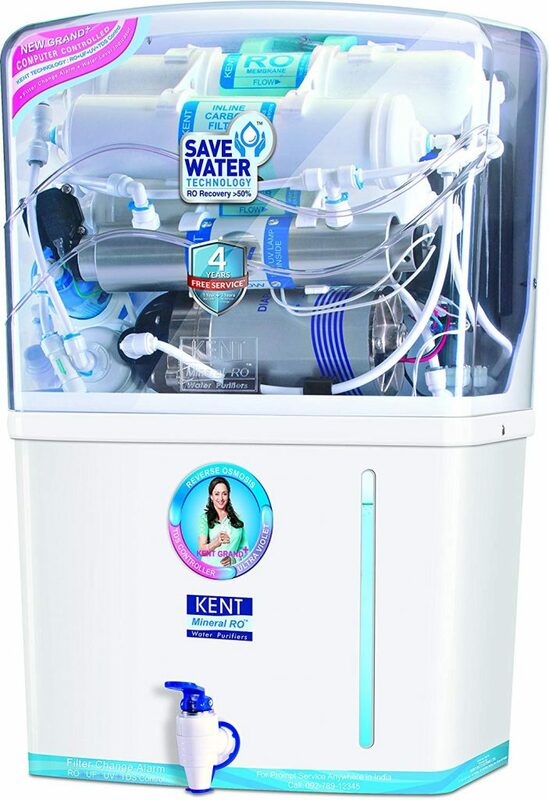 Kent is one of the top ranking water purifiers and with good reason; they have managed to gain a reputation for developing some of the best water purifiers and their latest Ace mineral certainly adds to their repute only further. This product is elegantly designed in white and certainly looks good. This water purifier uses RO+UV+UF filters and its own patented technology to process and purify the water. It works effectively and uses just 60 watts to process water from any source, and clean it up of its various contaminants, leached chemicals, dirt, sediments, residues and more. It comes with a built-in `11 watt UV lamp which effectively helps to clean the water of various microorganisms as well. this is best selling RO water purifier in India. This is one elegantly designed water purifier that catches your eye immediately; but what makes this purifier stand out is that it comes with a built-in voltage guard that helps to protect it and keep it functioning normally, during times of high as well as low voltage. This water purifier is engineered to be durable and long-standing; moreover, it also comes with 6-litre storage tanks as well. This water purifier uses RO+UV filters and a six-stage filtration process to clean and purify the water effectively. 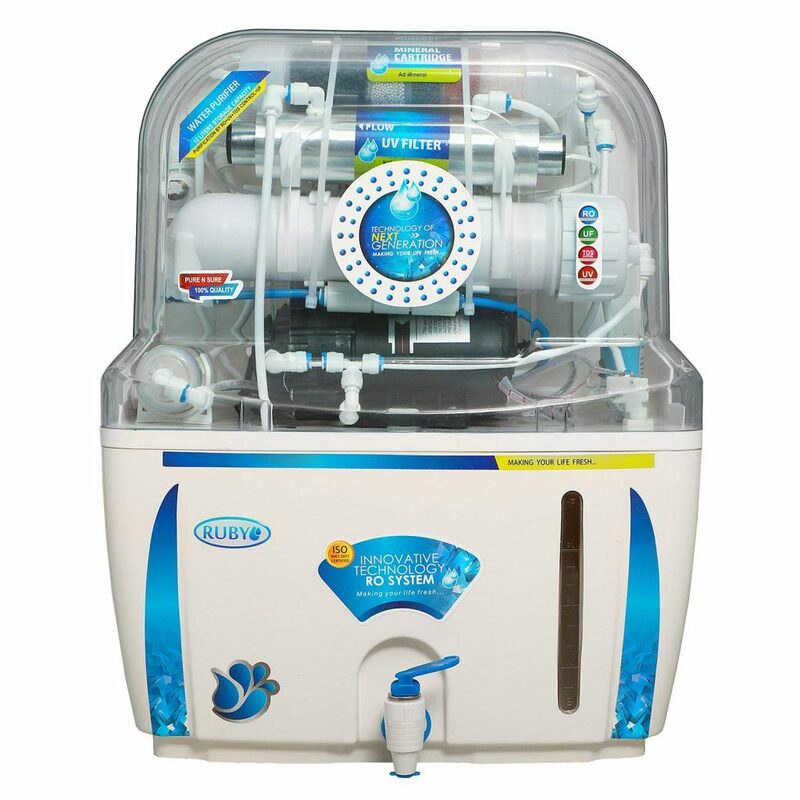 It also comes with TDS controller which can work effectively at 1800 PPM, it is quite good and one that you would seriously need to consider when it comes to water purifiers. this is the best water purifier for small families. 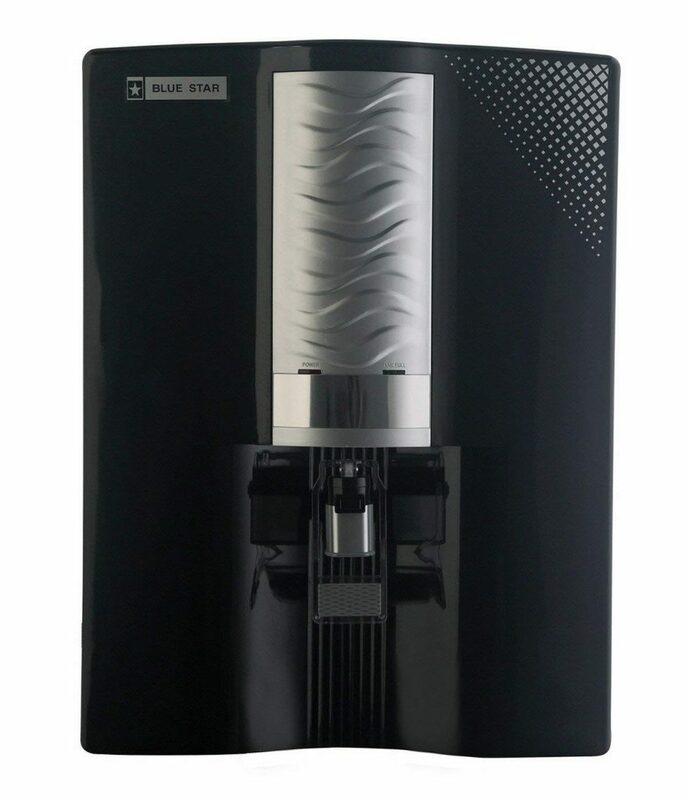 This is yet another sleek and well-designed water purifier from Blue Star; it certainly looks great in black and comes loaded with all the advanced functionality that you would want. For starters, this water purifier comes with UV+RO protection and uses the six-stage filtration process by which it effectively cleans out all the contaminants, impurities, germs, sediments, microbes and others from the water. It also uses unique and patented ATB technology which helps to boost the taste of the water as well. It is quite fast and its RO membrane can effectively filter 285 litres of water each day, and what’s more, this product also comes with 8-liter storage tanks so you can stock up on the filtered water as well. It certainly comes with the requisite security such as child lock as well as alarms that go off when the storage tanks are full. 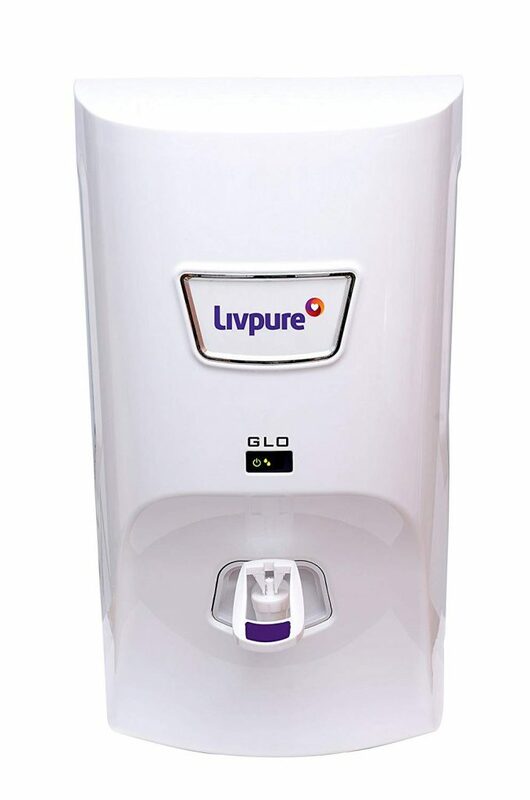 The ruby water purifiers is comes on 9th place in the list of best water purifier in India. The Ruby water purifier uses RO+UV as well as six stage water filtration process to effectively clean and purify the water. What makes this purifier stand out is that it comes with a composite RO membrane that can effectively filter around 75 gallons each day. And then, there’s the fact that this product also comes with activated carbon filter which effectively removes 99% of the chlorine and other chemicals contained in the water. It also comes with built-in UV light which effectively kills all the bacteria and other microorganisms contained in the water. What makes this product stand out is that it helps to purify the water and in the process, also boosts the mineral quality of the water as well. 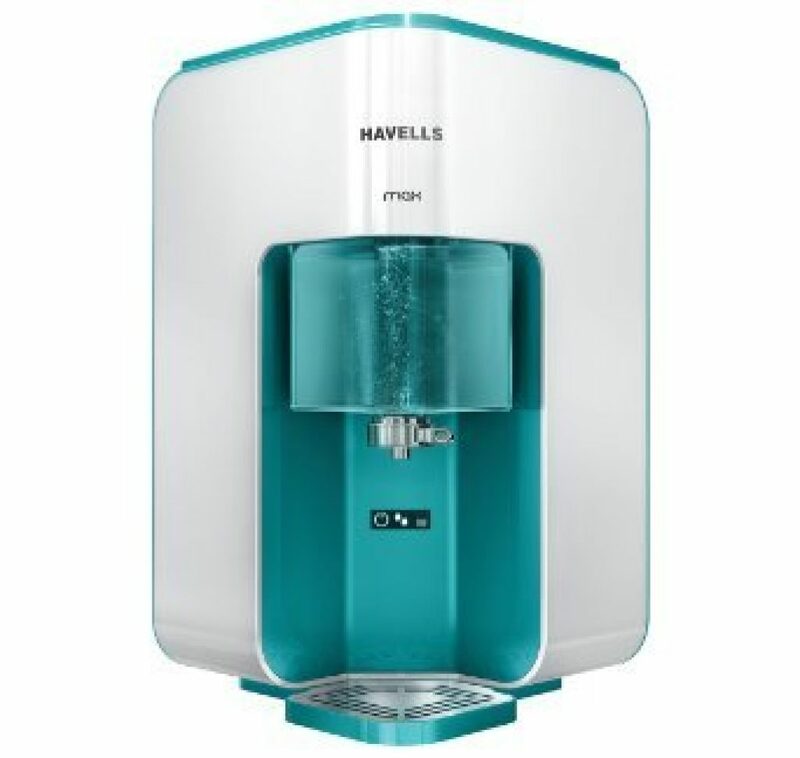 If you are looking for something more than a mere water purifier but need one that comes loaded with advanced functionality, then you need to take a closer look at Havells Max water purifier. This product uses UV+RO membrane and a seven stage process to effectively process, filter and purify the water. What makes this water purifier stand out is that it comes with a revitalizer which restructures the water molecules, and makes it more active, and in the process makes it healthier for you as well. Incidentally, this best water purifier comes with an extra mineral cartridge through which the filtered water passes through. This helps to boost the mineral component of the purified water and even makes it taste better. This features under best selling RO water purifier on Amazon.in. According to the government of India and more specifically, according to the ministry of drinking water and sanitation, more than 4 crores rural Indians regularly, drink metal contaminated water. If you thought that was bad enough, it may shock you to learn that over 6 million tourists visiting India each year, complain of Diarrhea, which had been mainly bought about by drinking contaminated water. This only underscores the fact that waterborne diseases pan India is not an exception but more of a norm. According to the water Gap, more than 163 million do not have access to clean drinking water, and the number of water habitats that are being affected by metal contaminants, and other impurities are seeing an exponential increase, all across India. Furthermore, this has only served to exacerbate the problem, where cross-contamination often takes place, and more of the public become affected by various water-borne diseases and parasitical conditions, such as cholera, tuberculosis, diarrhoea, typhoid, hepatitis A and much more. Isn’t boiling water before drinking it, enough? Of course, then there’s the old wives’ tale as to how just heating up the water should kill all the bacteria and germs contained in it. It may certainly surprise you to know that certain bacteria and pathogens have developed resistance to high temperatures so you cannot be sure that merely boiling water is not going to do the trick. This is why you need a water purifier and a good quality one at that. So, you plan to boil the water for dealing with various pathogens, fair enough but what about the various metal contaminants often found in water, including arsenic and other impurities? Merely boiling the water is not going to do the trick; you will need to use a good water purifier, preferably a reputed one, which utilizes various filters, including chemical ones, to remove all the impurities from the water. And in the process, it should also help to sanitize the water so that it is 100% safe to drink and free from contamination. When it comes to selecting and purchasing a water purifier for your home, you may want to keep a few factors in mind, so that you choose one that’s perfect for your home. Water quality: The first thing that you need to do is to test the quality of the water at your home. You may source your drinking water from external sources or from wells, sunk in your own home. But irrespective of where you obtain the water from, you still need to get it tested so as to obtain a clear profile of the same. You need to first determine if the water you use comes with high TDS or not, that is, does it come with enhanced salt content? And if it does, then you may want to opt for RO based water purifiers; if your water comes with muted TDS profile and is soft enough, then you can use a carbon filter based water purifier to treat the same. Incidentally, RO stands for reverse osmosis, a process that is often considered to be one of the most effective methods of removing impurities and contaminants from the water. Check water contamination: It is a good idea to test your water so that you will have a better idea of the contaminants contained in the same. Then, you can select a water purifier that is known to be quite effective in removing these contaminants so that you can have access to 100% clean drinking water. Storage capacity: Another important factor that you may want to consider is the storage capacity of the water purifier. It should be enough to meet your daily needs quite effectively. For example, let’s say that your whole family needs to have access to at least 5 gallons of clean, drinking water each day. In that case, you would need to go for a water purifier that is not just effective in purifying the water but also comes with a storage capacity of 5 gallons, which should help you meet your family’s current need for the whole day. Maintenance: It is important that you maintain your water purifier by cleaning it regularly. It would be a good idea to go in for a water purifier that also offers regular maintenance calls and a change of cartridges at least once a year. This should ensure that your water purifier continues to function seamlessly and without a hitch. 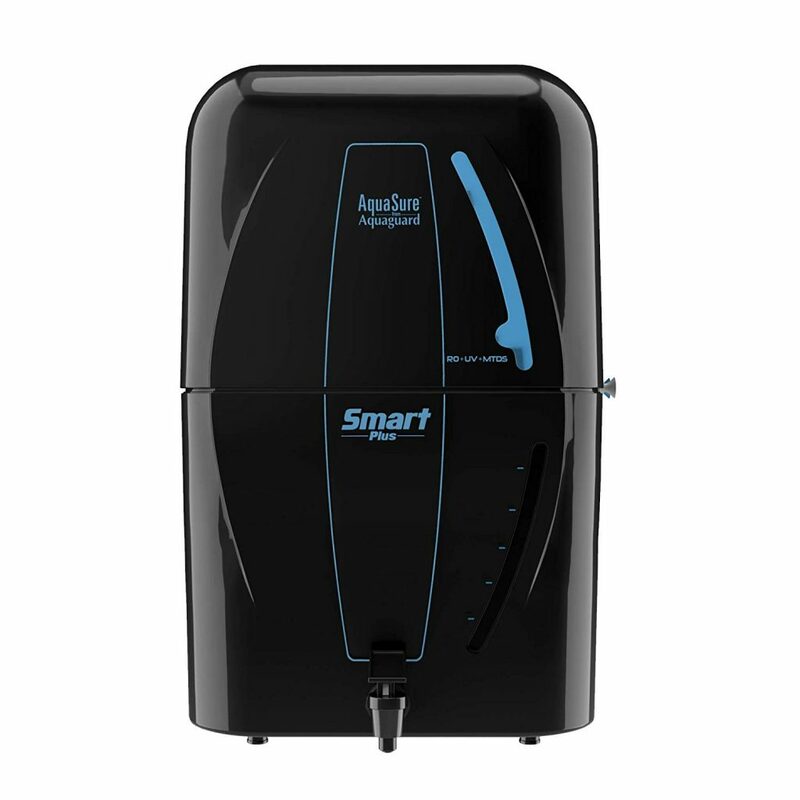 Warranty: It goes without saying that you need to go in for water purifiers that come with the required warranty. This can vary from one purifier to the next, so choose one that provides you with a complete warranty and has also gotten rave reviews from other customers as well. Cost: The price tag is an important metric as well and one that you need to seriously consider. A few water purifiers come with all the advanced functionality that you need but are also surprisingly affordable. 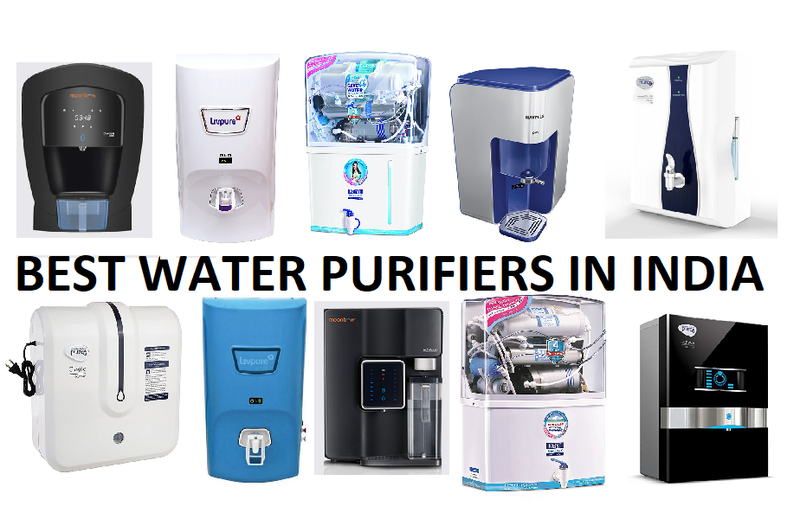 So check out some of the top-ranked water purifiers that we have reviewed, check out its features and main functionalities, its price tag etc. Once you have reviewed all the water purifiers, you need to decide which sounds better to you and opt for the same, at the earliest. These are some of the best ranking water purifiers in India today. And each water purifier stands out for one reason or the other and you need to check each one out, determine its key functionalities and features, and see if it is the sort of water purifier that you are looking for. Water, especially clean drinking water is essential and with the help of these best water purifiers, you should be able to provide your whole family with 100% clean and safe drinking water. And some of these water purifiers do a lot more than just clean your water, they add more minerals to it and even help to change its taste for the better as well. Check them out and choose the one that seems to be a good fit. 1.11 Why do you need a water purifier? 1.12 Isn’t boiling water before drinking it, enough?